Birmingham residents are complaining that piles of rubbish are back on the streets despite a resolution to 2017's long-running bin collection dispute. The backlog has emerged after new shift patterns for refuse collectors were rolled out in September. The council says a five-day rota for staff is having teething troubles as it beds in. Some bin workers have told the BBC collections may have been missed on up to 1,000 streets in the last fortnight. The new system, which sees employees moving to five-day weeks, is the result of an agreement between the authority and staff after a dispute which caused a three-month strike in the summer of 2017. The industrial action saw thousands of tonnes of waste left on the city's streets. But as the rota changes are deployed, residents say they are back to square one. 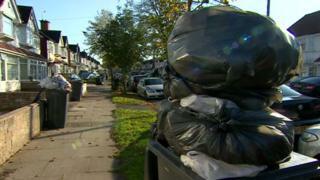 Manesh Mistry said rubbish on Tetley Road in Tyseley had been "piling up for weeks". He said: "It's going to create rodents and other issues. "We've had no other information from the council. I've been on their website and it doesn't mention anything. "You pay your taxes for services and it's not being done." Mohammed Hasan, a Hall Green resident, said it had been three weeks since his rubbish was collected - the same period cited by Chrissie Boyer from Moseley. She said the situation was "as bad as when [workers] were on strike." The dispute began when the council's bid to "modernise" the service - to save £5m a year - threatened more than 100 jobs. The future of the affected employees was secured when they switched to new roles with a greater focus on recycling. Earlier this week, a council telephone helpline was playing out a message to say the authority was dealing with a high volume of missed collections. A spokesperson said: "Unfortunately there may be some disruption to service as we transition from the old to the new model. "Scheduled collection days for households remain the same but the rounds that crews are working will be different and the new routes will inevitably take some time to bed in. "If any collections are missed, please accept our apologies in advance, and report uncollected bins and we will pick up your waste as soon as possible."